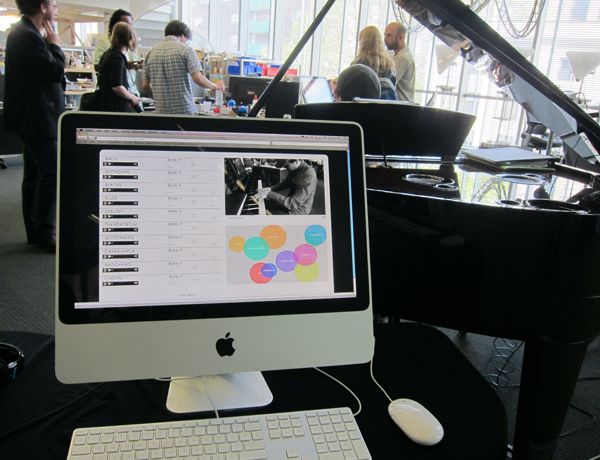 Kim, a graduate of the New England Conservatory, had been playing the piano in the MIT Media Lab’s “Opera of the Future” lab for three and a half hours at the lab’s spring meeting earlier this week. But there was no sheet music on the music stand. Instead, Kim watched colourful bubbles on an iPad that displayed what people watching along online wanted to hear. The piece was “an experiment in collaborative improvisation”, says composer and lab director Tod Machover. People at home could listen to ten clips of music from Bach to the Beatles and rate their preferences. If listeners said, “This is nice, but I’d like a little more Radiohead and a little less Schubert,” Kim had to respond by improvising in real time. The event was designed to test a new tool and approach to engage Toronto residents in contributing musical ideas to our current project, “A Toronto Symphony: Concerto for Composer and City.” Visit the site for more information and to SIGN UP! !